5 uneventful, easy paced miles today. today was sposed to be 13x400 at around 80 seconds per. The wind was terrible though, 30-40 mph steady, it was unreal. On the exposed track, i was no match for it and ended up only getting in 10 x 400, still managed right near 80 seconds per. I figured It'd be smart not to wear myself out the week of a race, that wind was equivalent to the hills I did last week, or at least thats how i feel now. pre-race systems check. 2 miles, 15:06, 7:33 avg. Sioux City Race for the Cure today. My first race of 2010, i cant believe its been 6 months since I last raced. Had a good warmup of around 12 minutes and strides. Started off the first mile easier than some of the sprinter-types. Hit mile 1 in 5:32.6. Started the race in about 5th, but by mile 1 it was a two man race, me and the leader, who had about 15 seconds on me, i clocked him around 5:16 for his first mile. Hit the 2nd mile in 5:54.5 (11:27), I had gained a lot of ground on the leader, he maybe had 5 seconds on me by the 2nd mile. From the halfway point through the 2nd mile I noticed he kept looking back to see where I was. From the first time he did this, I knew I had the race won. You dont look back unless you can feel something slipping, ive been there before unfortunately. I ended up passing him with around 600 to go for the lead. I felt good throughout the race, and really had more than enough to solidly close the race. Took the 3rd mile in 5:41.6, a 13 second negative split from mile 2. Finished up the last .1 in 39 seconds. Ended up pulling away to win the race by 6 seconds. Pretty exciting, I love winning races, its a great feeling. Got nice recognition at the awards ceremony, even was handed the microphone on stage to answer a few questions in front of a large audience...kind of caught me off guard. The main thing that today was about though was the cause--racing for breast cancer, I love doing races for such good causes and to be able to win today I felt like was a tribute to those who aren't so fortunate and aren't able to enjoy a weekend road race like I am. Pretty cool all around. Cooled down for about 2 miles and some light static stretching. Next decision, whether to race 5k or 10k this coming saturday...prolly shoot for the 5k again. 6 soaking wet and cold miles today total. 3 miles total w/u and c/d with 12x400 repeats on the track with 1:15 rep breaks. Hit each between 1:18-1:20, total time was 15:48 for 3 miles or 5:16 avg pace. Felt pretty good given the conditions and felt like I was flowing. leaning towards 5k this weekend. 4 easy today in 29:35, or 7:24 avg pace. I am going to run the 10k this weekend, shooting for somewhere in the 36's. pre race 2 today, felt a little sluggish, not too concerned because I always feel bad running first thing in the mornings. 14:56, 7:28 avg for the run. Just a nice easy shakeout with 6 strides afterwards to boot. Overall, I actually am not happy with that time at all. I felt like I easily should have been under 37. I was disappointed to see my finish time when I came across the line. I just got tired late in the race, probably because all of my speed work has been shorter and quicker lately as I have been 5k prepping. It shows that I had it through 4 miles then kind of went downhill. Another reason I slowed after that first 5k (which was 18:30 and right on 37 pace), was that I had no one to run with. I won the race by 3 minutes so I had no one pushing me, i always feel like others help push me to run faster. I did catch a lot of the 5k people, so that helped a little, but overall, i just lost some steam and got tired. Need some more training for these longer runs. Oh well, i cant complain, I won and got $40 cash for the win! Plus they are sending me a custom tulip time mug in the mail. It was a great day, awesome weather, great people, well organized, i thoroughly enjoyed myself. lovely day for an 8 mile bike ride, almost went all the way to the missouri river and back. Felt good to get in a nice long spin. I took 3:05 and 3:04 rest between the reps. Overall, I am very happy with how I ran today with this workout. My next race is in 3 weeks and one of the nice things about this race is there is a $50 prize if you can break the course record, which is 17:16. I have gone well faster than this before obviously, but it's a matter of dialing my speed back in to that level because I haven't been there yet this year. Today's speedwork adds up (with the predicted last .1) to right around 17:16, so that is a great sign! Gonna keep working hard to make sure I can run sub 17:16...that is assuming I win the race in the first place! Gotta have high goals tho! Another killer workout today. did the 400 uphill beast workout again. Went 8 sets up hard, averaged between 1:26-1:30 per 400 straight uphill, so pretty decent. Then jogged down for recovery. Will be sore tomorrow, but this workout is good for getting better. Hot and humid even early in the morning. 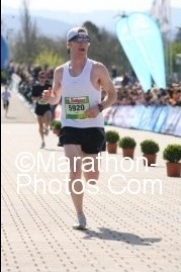 Kept a solid pace throughout, 1:14:39, 7:28 avg. So, all totaled, I hit my reps in the times I wanted.took around 1:15 walking recovery between each rep and around 1:45 between the set (mile) breaks. Felt really good about today's workout and hope that it translates to some fast race times. 5 easy miles today in 36:50, 7:22 avg pace. 1 mile was around 6:50, so GMP. Overall felt great, Happy with the 5:11 on the opener. Felt good moving that fast. Got new shoes today, wasn't planning on breaking them in on this long of run but I did. Went no watch or real clue of my distance, kind of nice to just run free. Didnt really have a choice though, out at the fiance's for the weekend. ended up mapping my run and found it was 10.3, not sure on total time of the run, but over 1:15:00 im sure. 5 slow miles today, didnt feel real great. 36:50, 7:22 avg.